Time is something we may have plenty of (if we are retired) or not enough of if we are in full time employment and/or looking after a young family. 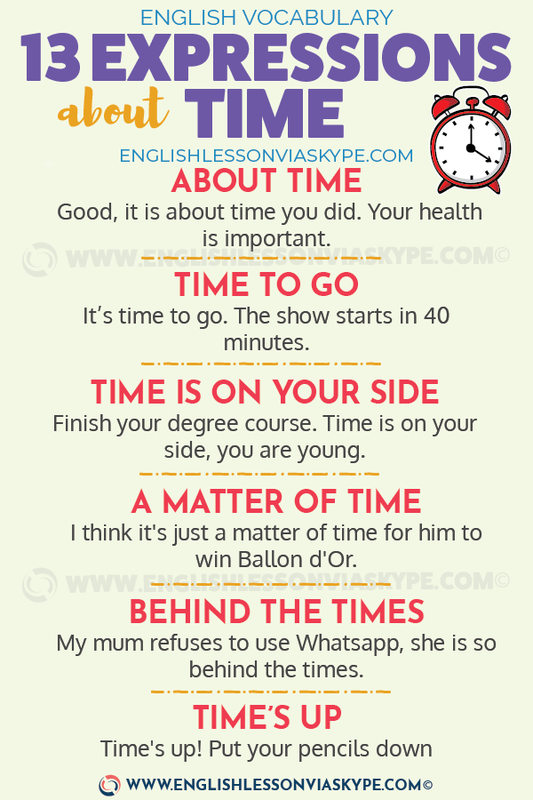 Here are some useful English expressions about TIME. We may have been waiting a while for a bus or for a service to be provided and when eventually that bus arrives or the service is eventually provided we can use the phrase it’s about time. Something happens that you have been waiting to happen for quite a while. It should have happened earlier. It has many uses. – I have decided to go to the doctor and tell him about that problem I have been having. – Good it is about time you did. Your health is important. Don’t you think its about time you went to the gym? You have put on a bit of weight you need to watch it. When you know you have had enough or have overstayed (stayed too long) your welcome at a party then its definitely time to go! It means it is a good idea to leave. We can also use it to indicate to somebody that you have to leave in order to catch a train or a plane or to make it to the cinema in time. It’s time to go. The show starts in 40 minutes. A favourite phrase/expression of business people. A lot of self employed and professional people charge hourly rates for their services. They do not usually like to waste time talking to someone if it is unproductive and time they cannot charge for. Michael met his friend on the street. They spoke for 20 minutes then Michael looked at his watch and told his friend it was probably a good idea to go as he might be late for his meeting and time is money! If he was late he may not get paid. We are all aware that we cannot stop time. Minutes turn to hours and hours turn to days and before we know it months have passed by. 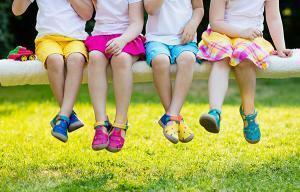 However, when we are young we don’t seem to have these concerns. The young have plenty of time. 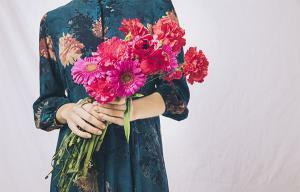 There is no rush to do something or make an immediate decision. You have time to think about it. Catherine was talking to her mother about her university studies. She was anxious to finish and begin her career. Her mother advised her to relax. Don’t worry so much, take your time. Finish your degree course. Time is on your side you are young. Sometimes we put up with something even though we would like to change. We do this either because we are lazy or have got used to it or are not sure if a change will necessarily improve matters. However, there comes a time (it becomes obvious) when a change is absolutely necessary. It’s time for a change. John had been doing the same job for fifteen years.He could hardly believe it was that long. Where had the time gone? (how had he spent so long doing the same job) He discussed it with his wife and decided to quit his job and start his own business. It was definitely time for a change. On time? In time? Sounds confusing, right? 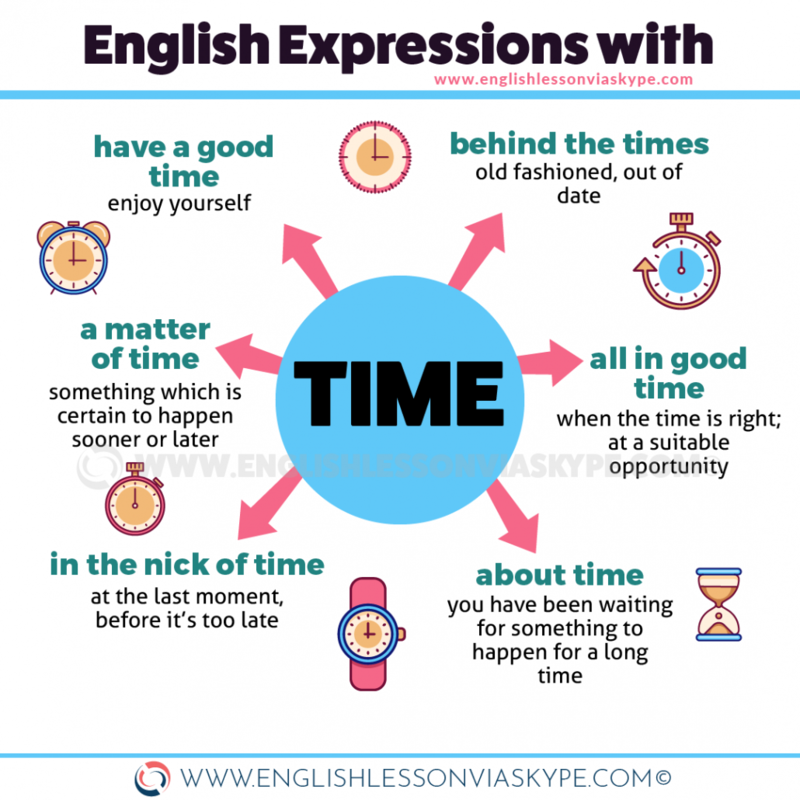 Now when you know English expressions about time, let’s clear up this confusion once and for all with this short English learning video. Hope you enjoy it! We got to the cinems in good time, so we were able to get popcorn and drinks before the movie began. I think it’s just a matter of time for him to win Ballon d’Or. He will find out all in good time whether it all works out. At one time I used to go to the theatre every week, but when we moved out of London it became more difficult. Thankfully we managed to check in and get to the gate in the nick of time for our flight. From time to time I go jogging in the park near the centre. Time’s up! Put your pencils down and pass your exam papers forward. My mum refuses to use Whatsapp, she is so behind the times. 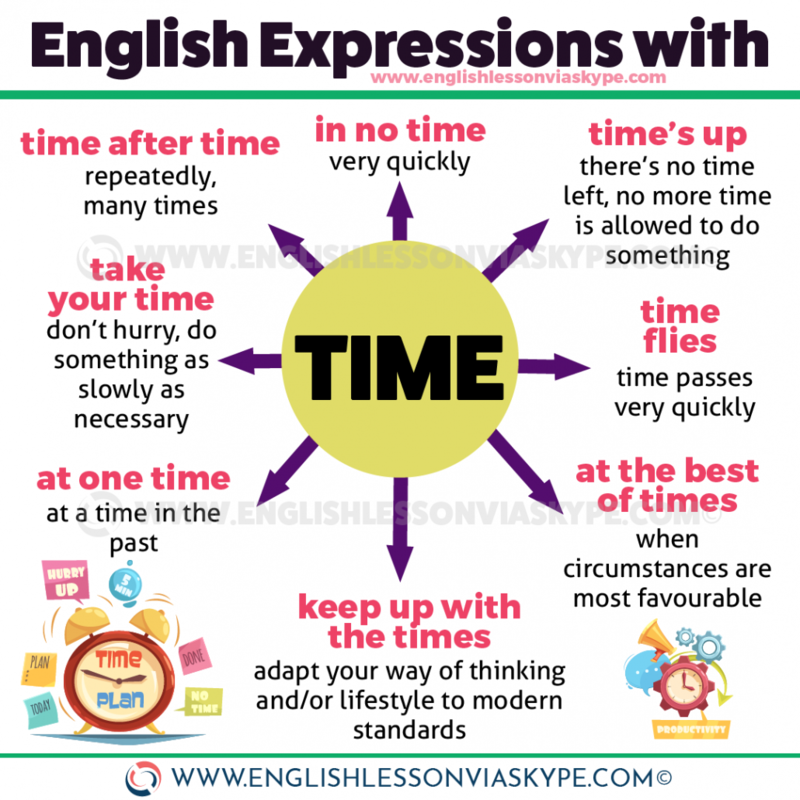 Making Suggestions in English – How about…?